Coastal AIS are shipboard-transponder- based systems for monitoring vessel traffic in the coastal waters. Starting from 2002, there will be mass introduction of transponders on all the ships of above 300 tons. Every several seconds such transponders automatically transmit their carriers' static and dynamic data. An AIS built into a VTMS is the most efficient. These systems complement each other superbly. VTMS provides a raw radar picture that, however, has some disadvantages. The detection range is rather short, especially for smaller targets; with intensive sea or rain clutter the target may not be detected; targets behind the islands or river turns are not visible; target's maneuver is not instantaneously detected due to the filtering and smoothing algorithms, etc. While the transponder, being a transmitter and providing practically online data on the gyro course and log speed, is virtually free of these disadvantages. Besides, it enables automatic identification of targets, which VTMS cannot do. If A1S station alone is installed on the coast, it is unaware of transponderless objects within its responsibility area. If an AIS is used as part of VTMS, having detected a transponderless target on the radar, the operator should enquire about its name, draft, size, etc., whereafter the incorporated AIS can broadcast this data for all the ships within the responsibility area. This would provide a partial solution for ships without transponders. Unfortunately there will still be problems with such object's calculated course and speed that will differ from the actual ones. On the Swedish coast only 35 AIS stations are installed. But this does not mean that there are 35 VTMS. Thousands of coastal AIS stations will possibly be installed worldwide to provide services to the Navies, Coast Guards (CG), maritime administrations and port authorities. But without primary radar information, the use of coastal AIS is not as efficient as it could be. It is only a target's echo that will help to detect and identify a transponderless target. Transas Marine offers an inexpensive solution for the problem of combining the primary and secondary radar information with transponder information on an electronic chart. The company has developed a Radarlntegrator Board which is connected to any existing radars (including old analog radars), digitizes raw radar information; regardless of the operator it extracts and tracks up to 512 targets, records all the target data and entire raw radar picture from each antenna revolution onto the disk during a month's time, enables playback of any time fragment. Such board operates in a standard PC using PCI bus. 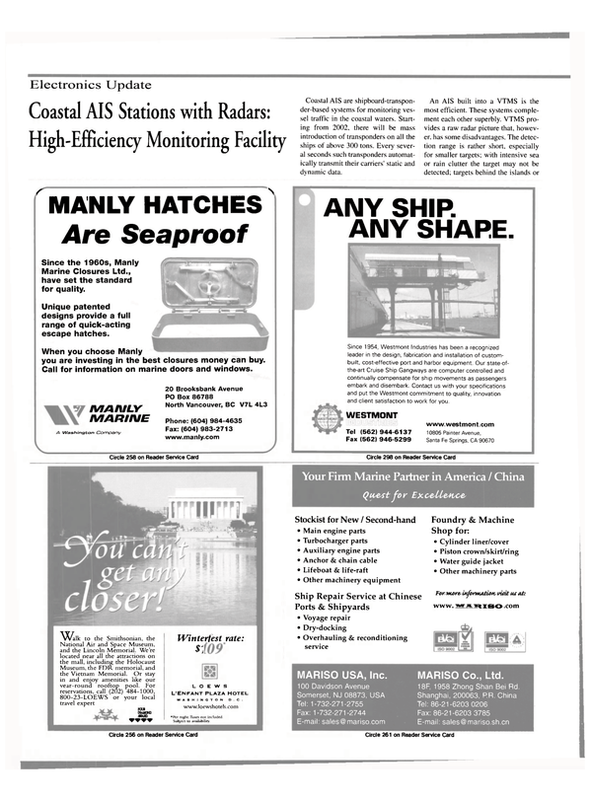 If an existing coastal monitoring station already has a radar (VTMS, CG, Naval or any other surveillance station), it is basically a matter of putting next to it a standard PC with the Radarlntegrator and appropriate software, which is linked to the radar and coastal AIS transponder. This means a highly efficient upgrade for thousands of existing radar surveillance stations. The technology of manufacturing radar antenna systems and transceivers has undergone practically no changes in the last 30 years. This is why it is worthwhile to upgrade even old radar surveillance stations whose antenna systems are not yet outdated and whose obsolete displays will in this case be replaced with a modern computer. If an AIS station has no radar, it is desirable to install an inexpensive ship radar transceiver with a 12-ft. antenna. In this case the Radarlntegrator Board will control the radar transceiver. Clearly, in case of a shipboard transceiver installation, such system cannot claim to be a VTMS station. But what you get is a very good AIS station. The radar target echo accuracy will be inferior to than in the VTMS due to the antenna size, but in an AIS this is secondary information which is only required for detecting and identifying transponderless targets. With the coastal AIS station without radar, the responsibility area loses its significance, as it is only objects with operating transponders that are monitored. Such objects are inherently lawabiding. Objects that have no desire to be monitored, e.g., all kinds of transgressors, will simply switch the transponder off. It is only by comparing the raw radar information with the transponder information that we can achieve efficient surveillance.